Healthy and diverse habitats mean healthy and diverse populations of fish. Habitats are simply those places where aquatic species live. the overall ecosystem (e.g. wetlands, floodplains, streams, estuaries, lakes, beaches). We all know fish live in water. However, water alone will not ensure that a fish is able to survive. Fish need habitat! The habitat is the water and all the other things that the fish needs to complete its lifecycle: like food and places to shelter (like snags or coral) and to breed (like gravel beds or seagrass). Some native fish also have to move between different habitats as they mature and breed. Different species have different habitat requirements and these may change throughout a fish’s life. A fish’s habitat is more than just the water. The water has to be the right type (freshwater, estuarine or saltwater), temperature, quantity (depth and flow) and quality. Water flow is regulated by dams and weirs and extracting water for drinking, stock and irrigation. In regulated rivers, water is captured in winter, stored, then released for irrigation purposes over summer. This has reversed the natural flow pattern to which native species have adapted. Fish are also very sensitive to the quality of water in which they live. Sediments, pesticides or other pollutants in the water may prevent native fish from living in affected habitat areas. 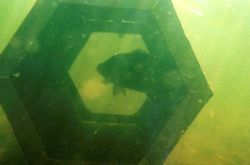 Pest species, such as carp, are more tolerant of poor water quality. The temperature of the water can also be important. For example, at 16-18°C silver perch start to migrate upstream and by 18°C 80% of the fish in an area will be moving. Golden perch prefer slightly warmer water. Adults start to move at 18° while juveniles prefer the water to be 22°C or higher. Rapid changes in temperature are not desirable. For example, cold water pollution can occur when water is released from the bottom of large dams and this pulse of cold water down a river reduces the potential for reproduction of native fish, sometimes for up to 100km downstream. All of the things that fish eat have habitat requirements of their own. So, changes to habitat might not affect the fish directly but might affect their food source. This, in turn, means that the fish can no longer survive in that habitat. Fish need to be able to hide from predators. They also need to shelter from extreme conditions such as flood flows and harsh sunlight. In freshwater, areas behind rocks, around submerged logs and branches (snags), among patches of vegetation, in deep pools or undercut banks all provide fish with places to shelter. 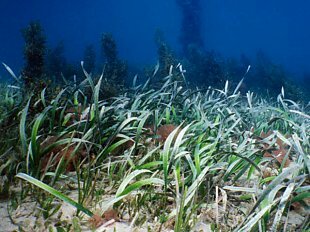 In estuaries, seagrasses and mangrove forests provide shelter for juvenile fish from predators. If these features are removed from fish habitat, then they become vulnerable to predators. Around 80% of Murray cod are found within 1 metre of a snag they can use for shelter. 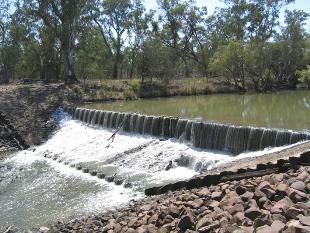 Barriers, such as road crossings, weirs, dams or floodgates, can block fish movement. Our native fish cannot jump nor can they swim very fast, therefore pipes (with high velocity water) and wet causeways with small, 10cm drops downstream are barriers to movement. This can have devastating impacts on local populations of fish. Barriers like these mean that fish cannot move upstream because the height and velocity of the water flowing over or through the structure are too strong to swim against. 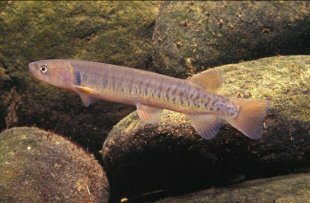 For many freshwater native fish, breeding is triggered by rising water temperatures and increases in day length. Processes that alter the natural water temperature of a stream, such as the release of cold water from the bottom of dams during summer, can prevent fish from breeding. The timing, quantity and duration of water flow can also have an impact on fish reproduction. Water flows can be significantly altered by river regulation (constructing dams and weirs and large-scale withdrawal of water for irrigation). In addition, fish are particular about the type of habitat on which they lay their eggs. For instance, some native fish lay their eggs in hollow logs or on snags, others use undercut banks or aquatic vegetation. Some, like the freshwater catfish, make a nest from gravel and will return to the same nest year after year. 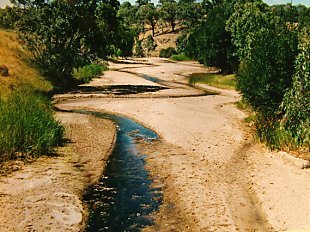 When snags are removed, banks collapse due to clearing of riparian vegetation and erosion, or sand and gravel is extracted or washed out the fish that rely on these features lose their places to breed. The broad-finned galaxias, Galaxias brevipinnis, spawns during high water flows in mid autumn. Spawning takes place over inundated streamside areas where eggs are laid amongst cobbles and pebbles. Before the next high flow eggs can be out of the water for days or weeks, lying up to 7m from the water's edge. When exposed, eggs need the streamside to remain damp, so shading by surrounding forest is critical. Hatching occurs when eggs are inundated by a subsequent flood. Cadwallader, PL., Eden, AK, and Hook, RA. Role of streamside vegetation as a food source for Galaxias olidus Gnnther (Pisces : Galaxiidae), Australian Journal of Marine and Freshwater Research 31(2): 257 – 262. Koehn, J. and Nicol, S. (1998). Habitat and movement requirements of fish. In proc. 1998 Riverine Environmental Forum (Eds. R.J. Banens and R. Lehane) pp. 1-6. October 1998, Brisbane, Queensland. Murray-Darling Basin Commission. Reynolds, L.F. (1983) Migration patterns of five fish species in the Murray-Darling river system, Australian Journal of Marine and Freshwater Research, 34: 857-871. Gehrke P. C., Gilligan D. M., and Barwick, M. (2002) Changes in fish communities of the Shoalhaven River 20 years after construction of Tallowa Dam, Australia, River Research and Applications 18:3 pp 265-286. O'Connor, WG; and Koehn, JD. (1998) Spawning of the broad-finned Galaxias, Galaxias brevipinnis Guenther (Pisces: Galaxiidae) in coastal streams of southeastern Australia, Ecology of Freshwater Fish 7(2):95-100.